You Can Sponsor this Podcast! 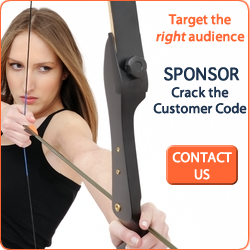 Are you interested in sponsoring Crack the Customer Code? We can provide exposure to a distinct audience of customer experience and customer service professionals and those who desire to expand their knowledge in these areas. One weekly promotional tweet from the accounts of Adam Toporek, Jeannie Walters, and 360Connext (combined reach of almost 12,000 followers) during the sponsorship period. For more information on getting your organization’s message to our targeted audience, please contact us at thecustomercode@gmail.com or (470) 223-CODE.